We can thank Rob Cowan, the English music broadcaster and writer, in part, for the encouragement he gave for the release of these rare Vox recordings, performed by the Russian pianist Alexander Borovsky. Andrew Rose, the producer and remastering engineer of this Pristine Audio set, supplies some interesting notes explaining the genesis of this project. Cowan has been a long-time devotee and campaigner of Berovsky's Bach cycles and had issued a plea for their release on CD. Rose obliged, tracking down near-mint copies of the LP originals. His assiduous work removing swish, among other things, is exemplary when one hears the final results. The French Suites, taped a year later than the English, have that marginal improvement in sound quality, accounted for by the rapid developments in technology at the time. Alexander Borovsky (1889-1968) was born in Mitau, Russia. His first piano teacher was his mother, but he later enrolled at the St. Petersburg Conservatory, where he studied with Anna Essipova. In 1912 he won the Anton Rubinstein competition. In parallel he took a law degree at St. Petersburg University. After the October Revolution of 1917, he left Russia and started touring Europe. He made his American debut in Carnegie Hall in 1923, and took US nationality in 1941. By this time Bach was becoming central to his repertoire. At the outbreak of war he'd travelled to South America and given numerous Bach cycles. His Bach evenings in Buenos Aires garnered much acclaim. He was the first pianist to record the composer’s 30 Inventions. In 1956 he took up a teaching post at Boston University. Yet, it wasn't all about Bach, his repertoire was wide-ranging and eclectic and featured many 20th century composers, including Hindemith, Schoenberg, Szymanowski and Stravinsky, in addition to several contemporary French composers. Borovsky's love of Bach is reflected in the performances here, which are brought vividly to life. His playing is what I would regard as safe. He's certainly not given over to extremes, with tempos nicely paced and a dynamic range that falls within the accepted consensus. His discreet, liquid and stylish ornamentation is another positive factor. At the time of his concertizing, critics praised his Bach playing for its architectural quality, and it's here for all to witness. His instinctive phrasing is natural and expressive. The faster movements have vitality without sacrificing clarity of texture, and the long lines of the sarabandes have a probing introspection. The lighter dance movements have a rhythmic buoyancy and infectious joie de vivre; sample the bourrée of the Second English Suite. Yet, what I find most compelling is the elegance and cultivated raffiné quality in such movements as, for instance, the opening Allemande of the French Suite No. 2 in C minor. 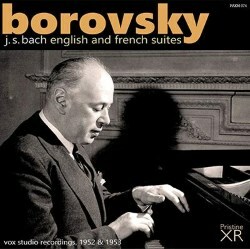 In his 47 years of performing, Borovsky was never accorded the recognition or reputation he deserved. I hope that this most welcome of releases will go some way to redressing the injustice.